The ‘Dependent Origination’ is also known as The ‘Wheel Of Life’ or Bhavachakra. It shows how and why beings suffer due to their karma or willful actions. All three animals are seen holding the other animal’s tail representing dependent relation between delusion, greed and anger I.e. Dependent on delusion arises greed/lust, with greed/lust arises anger and with anger arises further delusion. We can fall down far lower than what can be represented by these poor animals. Next to it is another ring showing beings falling down in lower realms and beings rising in better realms – engrossed or freed from greed, anger and delusion. Surrounding it are the six world systems or realms where a being can exist dependent on their karma. Gods(Deva): They have everything they want and have a pleasurable life. They have a very long life which seems eternal. This world is again divided into 16 world ranging from angels to the highest Brahma Loka. But once their good karma has exhausted they have to return back into one of the lower realms. Here a white Buddha can be seen playing harp reminding the Gods that their stay is temporary. Titans/Demi-gods/Demons(Asura): They have everything they want, including wealth and power, but still fight amongst themselves and with Gods for more. Here a green Buddha can be seen with a flaming sword in hand teaching them moral restraint. Humans(Manushya): In this world human beings experience both pleasures and pains of all the other world systems. 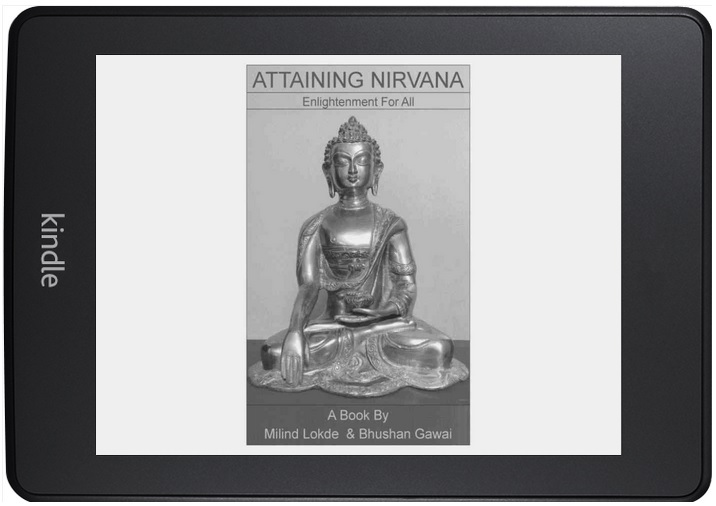 In addition Humans can have knowledge, will and ability needed to attain Nirvana and be free from suffering. This is why Human birth is fortunate and most suitable for attaining Nirvana among all the realms. This is also the reason why we must not waste this birth and mind our karma, and if possible try to attain Nirvana. We must also note that we now have the Buddha’s teachings – the guide, to attain Nirvana, which may in few 100 or 1000yrs be lost and the world may have to wait for the arrival of the next Buddha, which may be a very long long time. Here a yellow Buddha is seen teaching humans four noble truth and showing path to enlightenment. Hungry Ghost (Peta yoni): They keep on lusting after things, but are unable to get it. It is represented by beings with large belly and small mouth unable to eat enough to fill their stomach. Even what little they swallow causes intense fire in their stomach and whatever they drink turns into blood. Here a red Buddha can be seen holding a bottle of potion to heal these beings and teaching them to be generous. Hell (Naraka): Beings in this realm are tortured mercilessly. The hell is divided into hot and cold hells. Here Mara can be seen at the center holding a mirror in one hand and a weighing scale in other showing beings their deeds and giving punishment as per the weight of their karma. Here an indigo Buddha can be seen holding a lantern showing light of enlightenment in the darkness of hell. Animals (Prani): Here beings lack knowledge about good or bad/right or wrong and hence are unable to control their karma. This is also the only realm visible to us with our limited senses. Here a blue Buddha can be seen with a book in hand imparting wisdom and virtue of ethical conduct. It can be observed that while some beings experience pain and others pleasure, what is common is that the state is impermanent and leads to Dukkha/unsatisfactoriness and the only way out of Dukkha is Nirvana. The outer ring is the 12 dependent links or the dependent origination. Avijja:There is a blind man walking with the help of a stick. It represents Ignorance/Dellusion. Dependent on Ignorance arises volitional activities. It is represented by a potter making a pot (forming own karma with own actions). Dependent on volitional activities arises relinking consciousness, represented by a monkey jumping from one branch of tree to another leaving half-eaten fruit for another, like our mind never still for even a moment. Nama-Rupa: Dependent on relinking consciousness arises name and form duality. It is represented by twins rowing a boat. On name & form depends our six senses(five senses + mind which can emulate all the other senses). It is represented by a house with five windows and a door. Dependent on the six senses arises contact of each sense with its corresponding object. It is represented by a man and woman embracing. Dependent on contact arises sensation or feeling blinding us from choosing right from wrong. It is represented by a man with arrow pierced in his eye. Depending on contact arises craving. It is represented by a woman offering a drink to a man. Depending on craving arises attachment, represented by a monkey plucking a fruit from tree – a reaction a result of craving. kamma-bhava :On attachment arises becoming represented by a man and woman making love and giving rise to new life. Jati: On becoming arises birth represented by a woman giving birth. On birth arises sickness, old age and death and all suffering related with life. 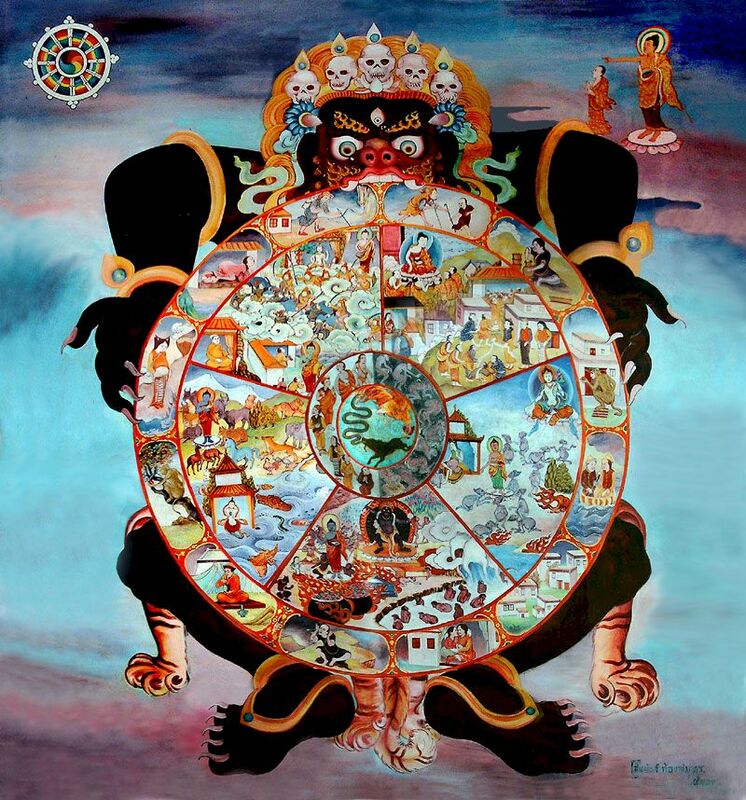 This ‘wheel of life’ can be seen rotated continuously by Mara – the symbolic God of death. Mara can be seen with three eyes four legs with claws and with sharp teeth rotating the Wheel of Life and not letting it stop. Outside the wheel of life Buddha can be seen completely free from the Dependent Origination or the ‘Wheel of Life’ showing his disciple the way of Nirvana.